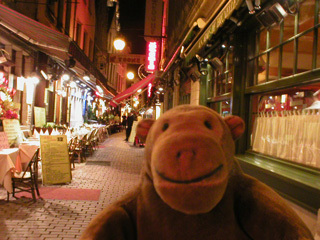 "I do like scampering after dark"
Mr Monkey's humans insisted on eating, as they so often do. They ended up at a restaurant on Petite Rue des Bouchers, one of the narrow roads full of eating places near to the Grand Place. 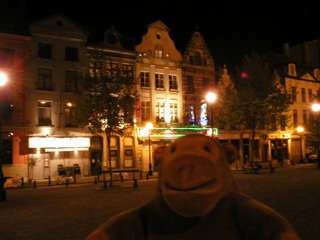 When they'd eaten, Mr Monkey led his humans through the not-very-dark-really streets of Brussels to the Place Sainte Catherine.